The History of the Tuscarora War including details of the cause, reason, and summary. The dates and years of the Indian wars - when the war started and when the conflict ended. Tuscarora War Summary and Definition: The Tuscarora War was a fought between colonists and settlers and various indigenous tribes in the area of North Carolina (North and South Carolina were one colony until 1729). 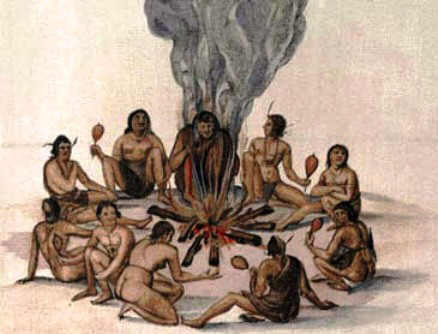 The Tuscarora tribe of Iroquoian speaking Indians were led by King Hancock in the south of the region. The Tuscarora War erupted due to land encroachment by the colonists, trade disputes and the actions of some settlers in enslaving some of the Tuscarora Indians. John Lawson, the Surveyor General of North Carolina, turned a 'blind eye' to these activities and was captured and executed by the Tuscarora tribe in 1711, which started the war. Chief Hancock enlisted the help of the Pamplico, Cothechney, Core, Mattamuskeet and the Matchepungoe tribes. Chief Tom Blunt in the North of the region refused to join the forces of Chief Hancock and sided with the British. Expeditions against the Tuscarora consisting of militia and Indian allies, including the Yamasee, were led by Colonel John Barnwell and Colonel James Moore. Chief Tom Blunt captured Chief Hancock who was executed by the British. There were many casualties in this bloody conflict - and Indian captives were sold into slavery. The Tuscarora tribe were forced to leave the area to escape from the colonists and settled in New York. The Tuscarora later became the sixth nation in the Iroquois Confederacy. The Yamasee became discontent with the British leading to the Yamasee War in 1715. This short History Timeline of the Tuscarora War provides fast facts and information about the history, years & dates, key events and famous people who fought in the Tuscarora War. 1700 The Tuscarora were a powerful tribe in Carolina and had established numerous large villages in the area. The Tuscarora primarily lived on the Roanoke, Tar, Pamlico, and Neuse Rivers. 1702 (1702-1713) Queen Anne's War (part of the French and Indian Wars) between the French and Spanish colonies allied with the Wabanaki Confederacy, Mohawk, Choctaw, Timucua, Apalachee and Natchez tribes against the British colonies allied with the Muscogee (Creek), Chickasaw and Yamasee tribes. 1713 Many of the Southern Tuscarora leave the area to escape from the colonists and headed for New York. The effects and significance of the Tuscarora in history is that the tribe was forced to leave their homelands. The languages, culture, religion, beliefs and ceremonies of conquered people fell into decline as they were absorbed into the Iroquois confederation. The number of people of the Tuscarora nation have significantly and sadly diminished. Their demise led to the prosperity of the white settlers and colonists who gained the land, natural resources and wealth of their lands. A direct result of the Tuscarora War highlighted the inability of the Lords Proprietors to act decisively and led to separate governments for North and South Carolina. During 1729 seven of the Lords Proprietors sold their interests in Carolina to the Crown, and both North Carolina and South Carolina became royal colonies. Tuscarora War. Discover the key years, famous people and events of the Tuscarora War together with the causes and effects of the war, conflict and battle. Pictures have been include wherever possible which show the battlefield, clothing and weapons of the Native Indian tribes and their leaders who fought in the Tuscarora War. The illustrated text provides a really useful educational resource for kids and children of all ages. We have included pictures and videos to accompany the main topic of this section - The Tuscarora War. The videos enable fast access to the images, paintings and pictures together with the information and the many facts featured on this subject of the Tuscarora War.